This blog marks the debut of our newly designed website. I need to thank my business partner Ginny Sykes, who seven years ago said I must have a website and a blog, and took on the task of making it happen when all I wanted was to make dough. This new version is a shared effort. Leading the enormous project of redesign is Angela Brown, our Director of Business Services. Angela has been with us the last few years enhancing our media outreach and working to ensure our systems are sustainable. We are thankful to have had her with us and will miss her as she moves on to complete her master's degree in media and cinema studies from DePaul University. Our new site features photos and videos that are larger, content that is interactive and should be easier to use. 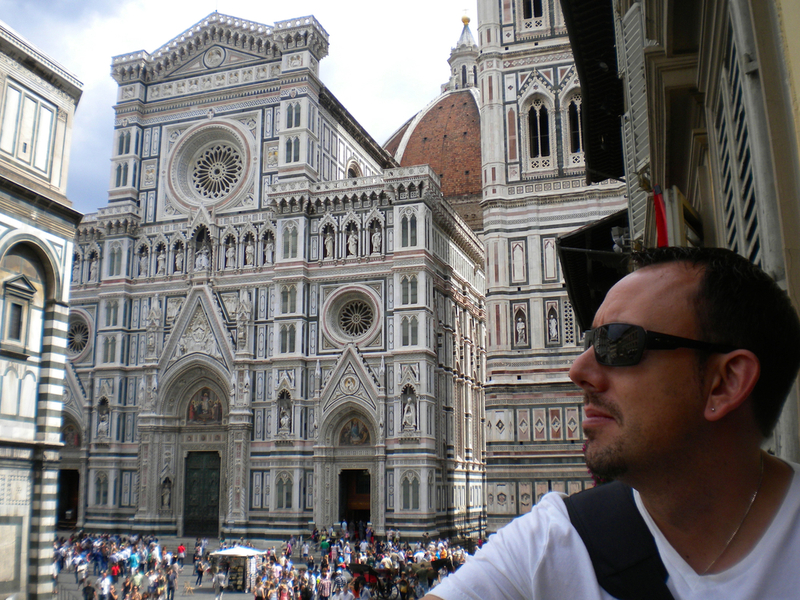 With this site we can better share what we learn and love about all things Italian with you. Ginny has been editing my blogs since we started the column in 2008. Those of you who know me know I can talk endlessly about Italy—she insures my words are clear and to the point. Let us know what you think. My September travels started in Castel Gondolfo, known as the Pope’s summer residence. I was joined by two of Spacca’s long time staff, Scott and Katie who had gone to Rome and Florence before we joined up. After a two-hour beautiful drive, we arrived at Le Campestre in Campania, where the always genuine, gracious hospitality of la famiglia Lombardi and the atmosphere of their agriturismoprovides tranquility before the chaotic rhythm of Naples and Spaccanapoli. My hope is as Spacca grows, additional staff can also experience Italy first hand. Primed after a taste of two of Italy’s big three, we shared, among other delights during their stay, the culinary mastery of Ristorante Bucci, Caseificio Il Casolare’s fresh bufala mozzarella, Massimo Alois’s indigenous wines, and Franco Pepe’s hand-crafted pizzas. Ah, street life Napoletan! Motorini careen through the narrow viccoli, exuberant voices shout and call, laundry waves in whatever breeze might arise comingling and contrasting with the solidity and gravity of old buildings and churches in an easy collision of different centuries. Pizzerias, friggitorias, fish and produce vendors, and artisans of every type are crammed into tiny spaces. Our first pizza stop was “a portare via’ from Antica Pizzeria Da Michele in Forcella so Katie and Scott could taste one of the pizzas I eat every time I am in Naples. It is the perfect choice for an afternoon snack and introduction to a culture of food that can be eaten on the street, improviso. Since 1870, only two types of pizza are offered at Da Michele, the Marinara and Margherita. The softness of Da Michelle’s pizza makes it unique and beloved. Back at B&B Donna Regina, host, good friend, and proprietor Domenico “Mimmo” Mazzella proceeded to dazzle us with his profound understanding of art, history, architecture, culture, food, and drink. This was paired with a glass of wine, a taste of cheese, and a touch of prosciutto. The B&B is a museum in its own right. Paintings, drawings, sculpture, and ceramics are casually on display everywhere. Later at Antica Osteria Pisano, one of my favorite nearby haunts, we dined on its simple yet sophisticated preparation of antipasti tipici, fresh local fish, and homemade pasta. From Naples we took a leisurely boat ride to the island of Ischia for a day of fun in the sun. From the boat we could see beautiful ancient villas dotting the coast. On the island we ate mussels, calamari fritti, coniglio all’Ischitana (rabbit) and drank Biancollella, the local white wine. We arrived in Capri the following morning and stayed in Anacapri for two days at Il Giardino dell’Arte (www.capri-ilgiardino.com). Anacapri is the highest point on the island and offers spectacular views of the sea. It is far from the hustle and bustle, and 25$ gelato of the rich and famous. We hiked Monte Solaro, enjoyed the sparkling waters along Capo di Farro, and relaxed in the flowering gardens of our tiny hotel. Back in Naples, before Scott and Katie’s departure, we sampled Di Matteo’s pizza and visited the Museo Archeologico and its vast collection of Greco-Roman artifacts. Laden with sculpture, mosaics, frescoes, and the erotica of Pompeii (Gabinetto Segreto), a stay in Naples is not complete without a visit to this museum. Domenico and I made plans to go to Cono’s in the Cilento. Even arriving close to midnight, his salumi, cheeses, hand-made pastas, and wine were on the table, with his accordion close by. The Cilento has World Heritage recognition and is to a good degree, undisturbed by the twenty-first century. There are pristine natural areas with a mix of mountains, forests, meadows, vineyards, olive groves, river valleys, canyons, medieval villages, ancient farmhouses and a stunning coast. The protected status enables remarkable food traditions to continue. In the morning Cono took us to a higher elevation. We passed a contadino as he was foraging for wild fennel; he would not share his other favorite spots. At the road’s end was an isolated house, with various outlying structures holding vegetable and fruit harvests, meats and cheeses. Cono shared a warm greeting with an older woman, who was his aunt. In the small cottage next to the mainhouse, her husband sat on a low stool and slowly, constantly, stirred sheep’s milk in a much used kettle over a low fire. I documented his methods while Domenico asked many questions about the process. A few days later Cono elaborated at length on cheese making, particularly how formaggio differs from ricotta and caccioricotta. A lovely afternoon hike up Mount Cervati (1899 meters high) to the sanctuary Madonna della Neve provided magnificent views of the surrounding mountains and the Diano Valley below. It is a favorite spot for pilgrims, with rich flora (beech, maple, oak, elder, holly) and abundant wildlife (wolves, wildcats, golden eagles, peregrine falcons). On coastal Palinuro we enjoyed ‘pizza biologica’ made by Domenico’s friend Franco at his Pizzeria Club Farine Med. Open two years, it is the essence of slow food and ‘the’ place for both locals and holiday travelers. With long rises and local organic products (salumi, artichokes di pertosa, eggplant, figs, mozzarellas, and oils), the pizzas are sublime. Topping it off, Cono came along for the ride and engaged a young gentleman in traditional songs of Tammurriata. Next, we turned to the wines of the Cilento. We have a wine of this region on our list, Silvia Imparato’s Montevetrano, a blend of classic French varietals and the indigenous aglianico grape. When it first came out in 1991, the renowned wine writer Robert Parker (Wine Advocate) declared he had found the Sassicaia of Southern Italy. Alongside classic, historic winemakers such as Mastroberardino (ten generations), there are new producers interested in flexible creativity rather than following the strict guidelines of the prestigious DOCG designation or DOC. Shelley Lindren, wine director of the acclaimed San Francisco restaurant A16, writes of these new and traditional wines in her book, “A16 Food and Wine.” One of her favorite people in this movement is Bruno De Conciliis of Azienda de Conciliis who spent some time with us despite the demands of the wine harvest. Bruno is a playful character. We found him in a tiny kitchen cooking greens. While family and fellow workers sat down to eat, we were served a plate of salumi and fresh bread and sampled all the wines in production. One of my favorites was “Bacioilcielo.” Bruno took liberty with Jimi Hendrix’s song Purple Lady, in this “kiss the sky wine”, a blend of aglianico, barbera, and primitivo. The wine’s softness makes it a perfect fit for our wine list. We had one more stop to make. The Azienda Agricola San Giovanni sits high above Castellabate with a commanding view of the sea below. Ida Budetta and her husband Mario Corrado graciously received us, even though we arrived unannounced. Their simple mission is to live in symbiosis with nature, to passionately work and protect the land of the Cilento. They limit their wine production to only four great wines. Should you be in the area, San Giovanni (www.agricolasangiovanni.it) is a must stop. Back in the centro storico of Naples, Domenico’s B&B Donna Regina has become a second home for me. Gabriella, his mother and a renowned artist, prepared lunch daily featuring local fish such as alici marinate, stocco e patate, lampuga in umido. Her cooking reflects a country surrounded by the sea, and a tradition where you find your favorite fishmonger and see what there is that day. Simple salads, good tomatoes, various cheeses and parmigianas rounded out the meals, always with new wines to discuss. I was reminded of my mother who loved to cook and feed everyone who came to her home. Domenico introduced me to a part of Naples in close proximity to the largest wholesale produce market in Campania. In the shadow of Vesuvius toward Sarnese Agro-Nocerino, the region of our beloved, mythic San Marzano tomato, Ristorante Biasella in Scafati serves cucina typica such as zuppa di fagioli, stocco e baccala, trippa e fagioli, zuppa forte, soffrito, melanzane, alici fritte. It is not a white tablecloth, fine dining affair, but a local place where you eat well and don’t pay much. The slopes of Vesuvius have optimal growing conditions for a wide variety of fruits and vegetables. The Mediterranean climate is mineral rich: volcanic soils and excellent drainage make this a perfect area for apricots, cherries, walnuts, tomatoes, and the falanghina, caprettone (coda d volpe) and peidirosso grapes. The Catalanesca grape is grown by local farmers in small quantities to produce an artisanal wine opaque in color, with a strong aftertaste. It is not readily available to the general public. In an effort to locate the wine, Domenico and I drove as high up as we could, where we passed fields of grapes and a horse riding stable. We ended up in Somma Vesuviana and asked about the wine at the first bar/café we found. We were given the name of a woman and directions to her home in Somma Vesuviana’s Borgo Antico. At first suspicious of two strangers, once she understood our intentions, she sold us the few bottles she had to spare at a good price and we left happy! That evening we attended a presentation of Riccardo Cotarella’s newly published book, “Quasi Un Ritratto.” The setting was an elegant vintage hotel above Napoli in Vomero. Cotarella is one of Italy’s leading wine consultants, a champion of the South’s capacity to produce great wines and a firm believer of terroir, the use of both local indigenous grapes and international varietals. Many well-respected individuals of the industry, such as Luigi Moio and Luciano Pignataro sang his praises. Listening to the enlightening and amusing opening introduction by one of Domenico’s former professors (Napoletano) I understood his profound influence on Domenico. Among the fifty wineries that consult with Ricardo Cotarella, two are featured on our reserve list: Montevetrano and Terra Di Lavoro. A few days later Domenico and I went to his uncle’s studio in another part of Vomero. Many members of the Mazzella-Raffone family are artists. A short description of his family is fascinating. Divided into two major branches, the first one concerns the paternal dynasty Mazzella. Domenico’s grandfather Mariano Mazzella, an excellent painter, married a noble woman, Luigia Giannini at the beginning of the last century. Four children were born from the marriage: Mimmo, Rosario, Luigi, and Napoleone. Three of the sons continued in the family’s artistic tradition: Rosario, art professor and painter, Luigi, sculptor and jeweler, and Napoleone, a painter and sculptor. Domenico, son of Napoleone, and his cousins Mariano, Laura, and Marcello Mazzella, are third generation in the arts with different specialties: Mariano is an architect, Laura, a ceramist, Marcello, an art professor and painter, and Domenico, an art restorer. The second branch is Domenico’s mother's family, Raffone. Catello Raffone was a famous printer who married Laura Pasquarella. From their marriage eight children were born: Bianca, Rosa, Giovanna, Gabriella, Pia, Sara, Mario and Paolo. Mario followed the paternal craft of the printer, Paolo is a musician, composer, and conductor, Rosa, an actress and poet, Gabriella, a ceramist and painter, and Giovanna, an excellent cook. Sisters Rosa and Gabriella married two brothers Luigi and Naploeone, joining the Mazzella and Raffone families. Napoleone has two other children, Marcella, a law student, and Camilla, an art history student and a painter by his current partner. A chance encounter at Terre Principe led to an invitation to visit with Luigi Moio of Quintodecimo. 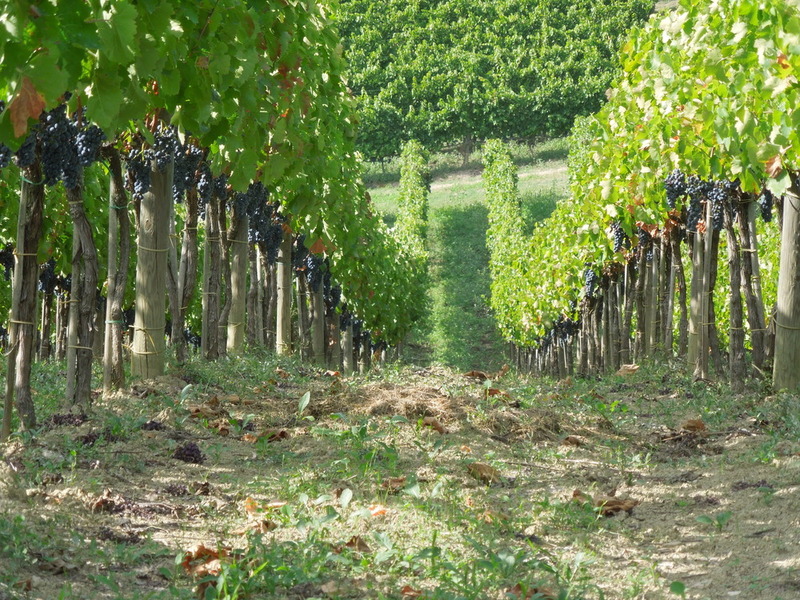 Established in 2001, Quintodecimo is located in Mirabella Eclano, not far from Taurasi. Together with his wife Laura Di Marzio , they produce elegant wines reflecting terroir, passion, and research. Moio, a professor of oenology at the University of Naples and consultant to many respected wineries, was my Holy Grail. I have long wanted to have Falerno Massico Rosso on our list. It comes from the family estate shared with his father and brother. Though this particular wine is still not available in America, I am happy that a wonderful Irpinia Aglianico from Quintodecimo is now available at Spacca Napoli. Ristorante Gli Scacchi in Casserta Vecchia is owned by a lovely couple, Gino Della Valle and Marilena Giuliano. Gli Scacchi proudly offers a gastronomy typical of the territory and true to generations past; “una cucina che attinge alla tradizione e I prodotti del territorio.” Gino works the front of the house and Marilena is in the kitchen. We enjoyed a leisurely meal of their famed and exquisite food and wines and a menu that varies with the seasons. A few of my favorites: mixed bean soup with mushrooms and asparagus; risotto with artichoke hearts and almond pesto; chestnut flour ravioli with sausage (mailino nero cassertana) and creamed potato; rice sartu with peas and quail; rabbit with aromatic herbs. When the bill was presented we were not allowed to pay. To be honest, I was not surprised. This Mediterranean generosity was typical of our experience when we lived in Florence and the Gargano years ago. They simply requested we bring them a good bourbon from the states next time. This four-hour feast precluded a visit to Gallardi in Roccamonfina, which was to be the last winery on our tour. Like Montevetrano, this small estate produces only one wine, Terra di Lavoro, also under the guidance of Ricardo Cotarella. The name of this praised iconic wine translates to ‘land of work’ reflecting the area’s soil composition, which is extremely rocky and thus difficult to cultivate. Yields and overall volume are very low; only a few thousand bottles are produced each year. Casserta Vecchia, founded by the Longobards (sp) in the eighth century, is a tranquil medieval village perched high above the plains of Casserta. Underneath lies the ruins of a Roman village. Its cathedral proudly displays its Arabic, Norman and Sicilian influences. A perfect spot for a day trip, its silence is a gift. The drive to Caiazzo from Casserta Vechia was beautiful, though a bit rushed. I continued solo to see Pepe In Grani, Franco’s new locale. Though there were finishing touches needed at Pepe In Grani, the oven was on and pizzas were made. My first dinner at Pepe In Grani inaugurated the kitchen. Around midnight two other dear friends of Franco joined us for pasta con aglio e olio (spaghetti with garlic and oil), and a good sparkling wine made from a local grape. This is a very exciting time for Franco. Considered by many as one of Italy’s finest pizza makers, his commitment to free and independent experimentation with different flours and grains along with his celebration of local gastronomic tradition and product makes him unique. A final sojourn to Le Campestre was a fitting end to this incredible journey. I walked the invigorating two and a half hour hike from Caiazzo by way of Villa Santa Croce. My only disappointment was missing the wine harvest with the family. As a sad footnote, the patriarch of the family, Nonno Antonio, passed away shortly after my visit, at the young age of ninety years. I loved being in his presence, as did everyone. Back once more to Naples. Along with two special mornings in the dough room of Antica Pizzeria Da Michele, ‘Il Tempio della Pizza’, I witnessed the celebration of San Gennaro at the Duomo, a short walk from Donna Regina. Excitement filled the air as thousands descended upon the church in anticipation of this religious ceremony, which dates back to the late 1300’s. As described in Napoli Unplugged (www.napoliunplugged.com), “San Gennaro’s blood was collected by a pious woman after he was decapitated in 305 AD and it was conserved in three glass vials. Three times a year these vials are removed from a safe in the Duomo and a procession moves the bust of San Gennaro and the vials of blood to the high alter of the Cathedral. The miracle of the liquefaction is considered a good omen for the city and is welcomed by prayers, thanks, and applause and announced to the city by 21 cannon shots fired from Castel dell’Ovo.” I was as pleased as the crowd when it was announced that the blood had liquefied. Forza San Gennarro! My September travels contained another element of research. Culminating in October in Chicago, Domenico and I presented “Touring Through the Flavors of Campania” at several locations in the Chicago area, partnering with the Italian Cultural Institute, Casa Italia and Casa Italiana. The program included Domenico’s deeply researched history of Campania, its foods of antiquity and today, and their combined and continuing importance. The idea for this symposium came when we decided to introduce a new work of art to the restaurant. Ginny Sykes and Julia Sowles-Barlow collaborated to interpret the ancient fresco ‘La Prima Vera’ from the Villa Arianna, Stabiae, 2nd c BC, as a mosaic that now adorns the side of our building. Their long artistic partnership is also steeped in Italian influence. Ginny studied painting and art history in Florence, and Julia trained in classical mosaic technique in Spilimbergo. Also known as” La Flora,” she is shielded in the evenings behind a metal gate adorned with the Ginestra flower. The daily opening and closing of the gate adds a lovely ritual to my day. The panel was dedicated on October 29th during our event entitled ”Food, Wine, Land and Sea”. 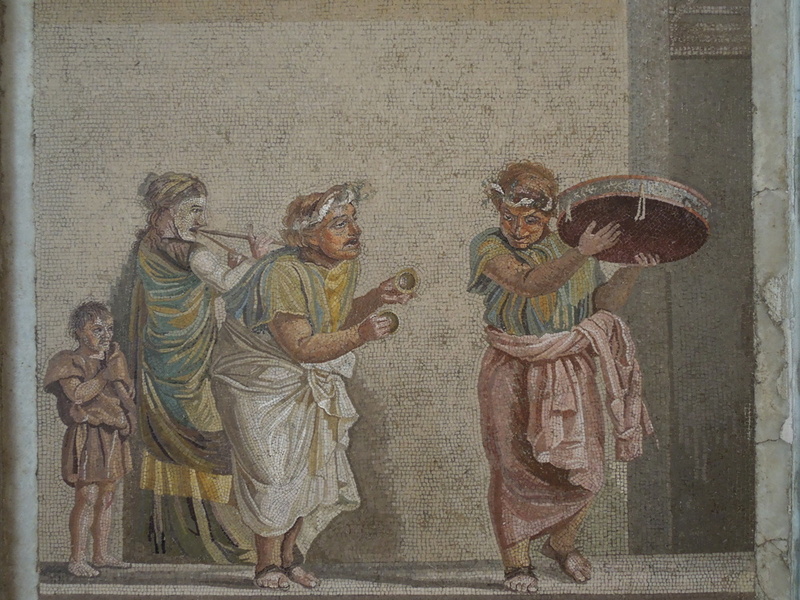 Domenico discussed Pompeii and the Food of the Ancient Romans, followed by an elaborate menu with recipes from the ancient Roman times, musica folklore (Tammurriata), and opera. Translating the recipes of Apicius from Latin to Italian to English was a Herculean task, which was eased by several bottles of wine. To be around the table, eating food and drink wine and share in conversation, is the essence of the word symposium and the foundation of Mediterranean culture. The influence of the Greeks is still felt today, thankfully so. We are blessed by tradition, by those who are its protectors and innovators. As our year comes to end, may there be peace and prosperity for all. Buon Anno!